If you hear scratching or scampering sounds in the ceiling at night, you've probably got rats or mice up there. This website is all about removing rats from buildings, and especially the attic. The attic space is of course above the ceiling (the ceiling is basically the floor of the attic), so go to the home page to read everything about removing rats from attics. There are some special considerations in some ceiling cases however. In the above photo, on the left side, we see an example of a rat trapped in a drop ceiling at an office. And in the right, we see a dead rat removed from a ceiling. Obviously you can't walk around in a drop ceiling, the way you can in an attic. But rats live in drop ceilings all the time - in commercial buildings, offices, even basements. Here, it's a pretty simple matter to just get on a step ladder and remove some of the drop ceiling tiles, and set traps on the other tiles. Quick and easy access. Learn more: What do rats sound like? Like rats in the walls, this is a case in which you can't easily set traps. You have to set traps in other areas that you do have access to, such as in the attic, or at the rat points of entry and exit into the house. If a rat dies in a ceiling area, and there is no access to an attic space above it, then I have to cut a hole in the ceiling to remove the rat. I've done this many, many, many times. CAN A RAT CHEW THROUGH THE CEILING? Actually, yes, and I have seen this a few times. Ceilings are almost always made of drywall, and a rat's hard teeth can make mincemeat out of the stuff. Rats often chew their way in if they detect a food source. That said, it's not a terribly common behavior. Rats in the ceiling can be difficult to trap and remove especially if your home is one of the few that lacks a proper attic. Most traditional homes have spaces between the interior ceilings and the roof which provide a chance to set traps. If your home has no crawl space or attic space and the rats are in the tiny area between shingles and drywall, you will need to be more inventive on how you place the traps. Traps can be secured to the outside of the home, on the roof. For modern homes with this unique dilemma, the help of a professional is highly advised. These experts will be able to determine where it is most practical to set traps and how to secure them in awkward places. Homes with attics can follow a few basic steps starting with outside prevention methods. Even if rats are already inside of your home, outside cleanup and home repair is essential to preventing more rodents from moving in. Once the home is patched the rats inside can be trapped and removed. Rats in the ceiling have to come out to feed. If an attic is involved, they will often use this space as a means of entering other points of the building, and you can trap there, if the ceiling space is not accessible by hatch, cut hole, or vent removal. Traps can be set in the attic space, baited with peanut butter or marshmallows. The best kind of trap remains a snap trap, but access in the ceiling is difficult. If you have a rat in your home you need to take care of the situation before it turns into an infestation. A single rat will leave a good trail of evidence in areas where it has been travelling. These areas are where you want to set up your traps. People assume that rats eliminate waste and then look for clean areas to eliminate in, much like a dog. This isn’t true. Rats use their feces and urine to make where they have been and to establish safe pathways. If there is rat excrement, the rat will return to that area. 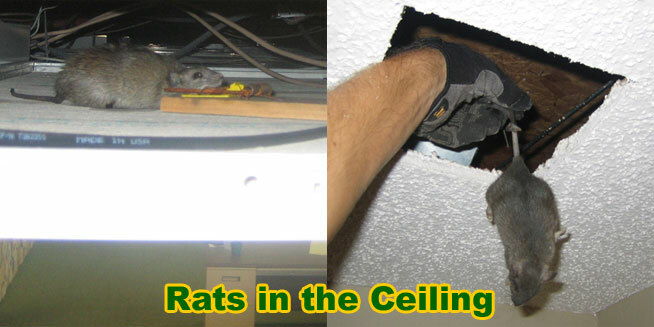 Rats in the ceiling and in the wall will most likely have some kind of activity level in the attic or ceiling space. This will be one of the best, if not most accessible, places to trap the rodent. If you can gain access through the attic, great. Vent panels are the next best option, if you unscrew them. Snap traps are the most reliable traps on the market. Mobile and simple, these devices can be purchased in bulk and then set accordingly throughout the home. Although I wrote this site with rats in mind, such as the Roof Rat and Norway Rat, the same principles apply to other rodents, such as the house mouse. Mice behave very similarly to rats, they're just smaller. Email me if you have any questions about how to remove a mouse from the ceiling, how get rid of mice in the ceiling, or any rodent in ceiling issues.